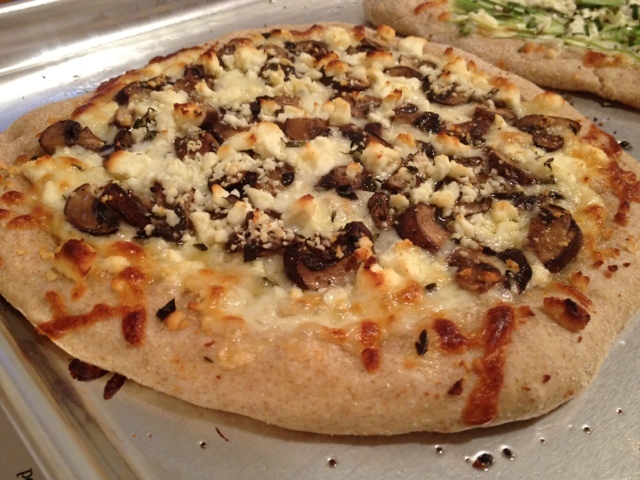 Making your own pizzas also means you can experiment with your favorite toppings, cheeses and crusts. I’ve used the refrigerated dough from the grocery store, but mixing up your own is just as easy—and you can boost the health factor with whole wheat flour. Get creative with vegetables and cheeses, and you’ll never realize that you’re missing meat. I get to walk three blocks to my house everyday for lunch, which means I can do a little prep before pizza nights with my friend. Using the nice, new food processor to mix up the dough makes it even easier. Let the yeast get bubbly in some sugar water, pour that into the bowl on the food processor filled with flour, salt and any herbs. Add a little oil and just pulse it together. Let the oiled ball sit covered, and at dinnertime, you’ll have a full bowl of dough. But what may be the best part of making your own pizza is choosing the toppings. A quick online search for vegetable topping ideas presents pages and pages of tried and true flavor combinations, as well as many more you’ll want to try and wonder why you didn’t think of sooner. You can put just about anything on a pizza—even salad. To make all the flavors stand out, I think it’s best to keep toppings simple, rather than pile on more and more. There’s a time and a place for overloaded pizzas. Tomato sauce is also not a requirement. Brushing on garlic and oil is also delicious. 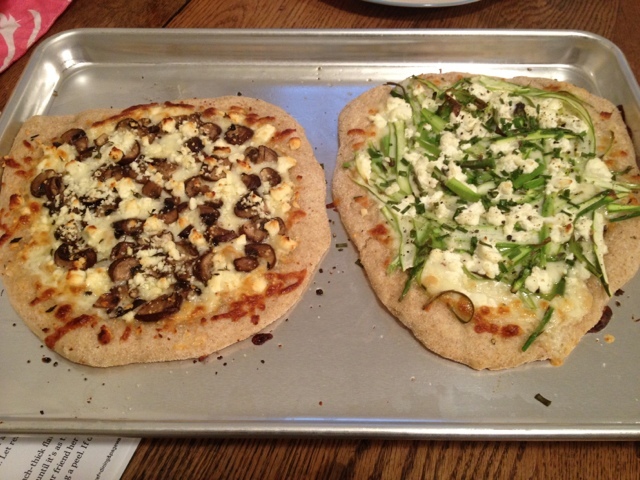 This week, I made two small pizzas using half a recipe of dough—and froze the other half to use another night soon. I’ve got a fridge packed with veggies right now, because I still haven’t mastered figuring out how much I’ll eat, based on what nights I’m working and if I’m gone for the weekend. The great thing about pizza is you can use just about anything you may have, and the end result will likely be tasty. For some reason that I don’t remember, I picked up a box of baby portabellas at the grocery store last weekend. I’ve been tossing them in salads and in my frittata-turned-scrambled-eggs. These mushrooms would be perfect for pizza. To up the flavor, I roasted them for awhile in the oven with oil, salt and pepper. 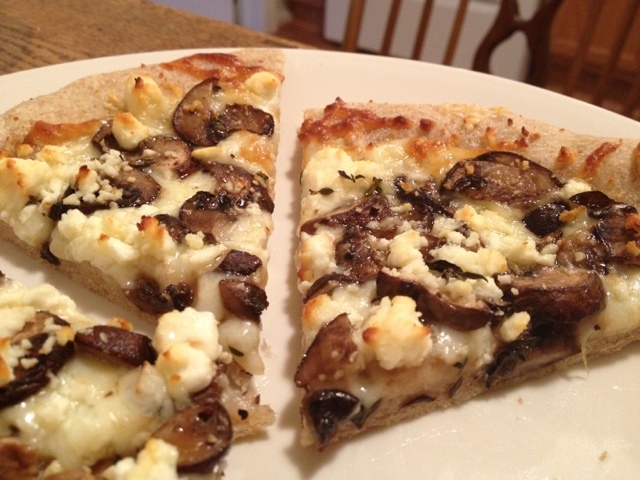 This pizza was topped with olive oil and garlic, mozzarella, fontina, the roasted mushrooms, feta and thyme. It was delicious, with several dimensions of rich flavors. I topped the second pizza with shaved asparagus from my uncle’s garden. I simply used a vegetable peeler to shave the thick asparagus into thin strips, cutting leftover pieces with a knife. The asparagus was piled on top of the same base that I used for the mushroom pizza—olive oil, garlic, mozzarella and fontina. The final flavors touches were goat cheese and chives. Also, delicious. Mmm. I am disappointed that all my leftovers are gone already. Though that means I have room in the fridge for another flavor combination! 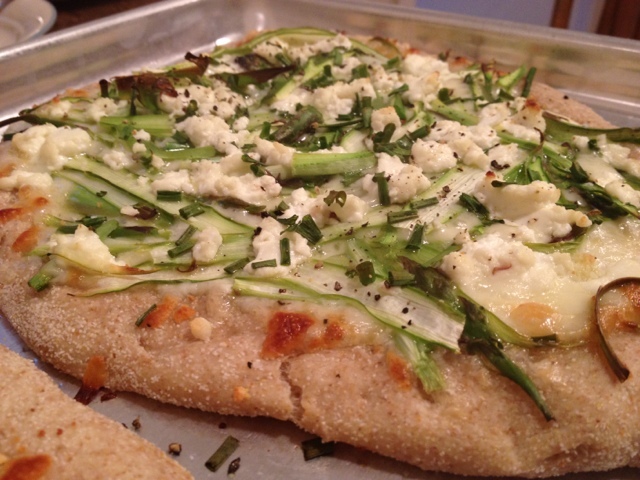 Here are some other vegetable pizza topping ideas—some I’ve tried, some I haven’t! Let’s get the creative juices going—what other combinations can you come up with? Add sugar to water in a measuring cup, and stir in yeast. Wait 5-10 minutes for it to get bubbly. Meanwhile, in the bowl of a food processor, combine flours, salt and herbs, if using. With food processor running, pour in yeast and oil, mixing for about 20 seconds, until a soft dough forms. Add more water or flour as needed. Shape the dough in a ball, place in oiled bowl and cover with clean dish towel or plastic wrap. Let dough double in size, at least an hour, or up to four or five or so. Divide into four pizzas to make about 10″ pizzas. Refrigerate or freeze remaining dough. Shape each piece of dough into a rough circle (or square, if you’re like me). Use cornmeal to keep it from sticking on the counter. Place on a cookie sheet with parchment paper, or a pizza stone, or a pizza peel, or an upside down pizza sheet. Bake at the hottest temperature your oven will go to—ours won’t go past 425 without setting off the smoke alarm, but you could set your oven to 500 if it won’t annoy roommates. Bake for about 10 minutes, or until the crust and cheeses are a golden brown. Katie – I’m so glad you’re using all your new kitchen tools. Your pizzas look AMAZING! Your Uncle Sal loved your mention of his name-twice !! Nice article-enjoyed your writing! Photos are mouthwatering! One of our favorites is using marinated artichoke hearts with kalamata olives with no sauce. Another fave is lemon pizza which we first had in Italy. Garlic, olive oil, fresh lemon juice, oregano and romano cheese whisked together and spread on dough then top with more romano cheese. Good as an appetizer!